Halea Locke, daughter of Jamie Locke, was crowned the 2017 Seward County 5 State Fair Queen. She was crowned Wednesday evening at the Gospel Fest by last years Queen Jessica Malin. The 3 candidates, Halea Locke, Kaitlyn Kirk and Maria Lezama, raised almost $7,000.00 thousand dollars for the Liberal Soroptomist Scholarship Program. 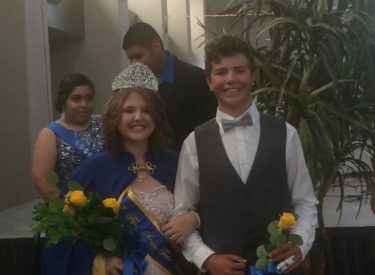 The candidates held several fundraising events over the last several weeks, with Halea edging out Kaitlyn as 1st attendant and Maria as second attendant. Halea will reign over the 5 State Fair, and will also be at several events throughout the year.